A pioneering proposal for a pluralistic extension of evolutionary theory, now updated to reflect the most recent research. This new edition of the widely read Evolution in Four Dimensions has been revised to reflect the spate of new discoveries in biology since the book was first published in 2005, offering corrections, an updated bibliography, and a substantial new chapter. Eva Jablonka and Marion Lamb's pioneering argument proposes that there is more to heredity than genes. They describe four "dimensions" in heredity-four inheritance systems that play a role in evolution: genetic, epigenetic (or non-DNA cellular transmission of traits), behavioral, and symbolic (transmission through language and other forms of symbolic communication). These systems, they argue, can all provide variations on which natural selection can act. Jablonka and Lamb present a richer, more complex view of evolution than that offered by the gene-based Modern Synthesis, arguing that induced and acquired changes also play a role. Their lucid and accessible text is accompanied by artist-physician Anna Zeligowski's lively drawings, which humorously and effectively illustrate the authors' points. Each chapter ends with a dialogue in which the authors refine their arguments against the vigorous skepticism of the fictional "I.M." (for Ipcha Mistabra-Aramaic for "the opposite conjecture"). 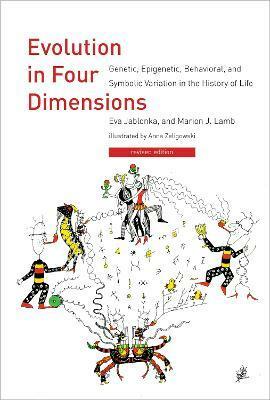 The extensive new chapter, presented engagingly as a dialogue with I.M., updates the information on each of the four dimensions-with special attention to the epigenetic, where there has been an explosion of new research. "With courage and verve, and in a style accessible to general readers, Jablonka and Lamb lay out some of the exciting new pathways of Darwinian evolution that have been uncovered by contemporary research." "In their beautifully written and impressively argued new book, Jablonka and Lamb show that the evidence from more than fifty years of molecular, behavioral and linguistic studies forces us to reevaluate our inherited understanding of evolution." "It is not only an enjoyable read, replete with ideas and facts of interest but it does the most valuable thing a book can do-it makes you think and reexamine your premises and long-held conclusions."